If you own a home or commercial property built prior to 1978, your building is undoubtedly posing a huge health risk to its occupants: Asbestos exposure, which can cause cancer, Mesothelioma, pneumonia and other life-threatening illnesses. You must have the asbestos removed and as soon as possible and our company is ready to help. We have handled asbestos remediation (site cleanup) and asbestos abatement (removal) in Orange County for 25 years. Siding and roof tiles, flooring and insulation, sheetrock, plaster and even “popcorn” ceiling tiles were all manufactured with asbestos well into the 1970’s. No one understood the danger posed when those asbestos-filled building materials began to degrade, releasing asbestos fibers into the air—and lungs of the people exposed. 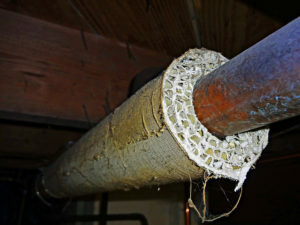 In order to establish if there is asbestos present, we contract with an independent testing firm that samples the air. If they find asbestos, we seal off the area and send in our certified and highly trained techs to begin the abatement process. They chip and scrape away the asbestos, using negative air machines to be sure no asbestos is released into the air. Next, in remediation, all exposed areas that contained asbestos are sealed and the whole area thoroughly cleaned. Then the air is resampled and, if no asbestos is found, we sign-off on the job and allow your family or employees back into this healthier environment. In Orange County, NY, call (877) 645-1428 for asbestos removal consulting.